Our 1000 program of compression latches is suited to use on electrical, electronic and storage housings, especially where subjected to vibration which may cause a non-compression latch to fail catastrophically, such as on gensets or vehicles. 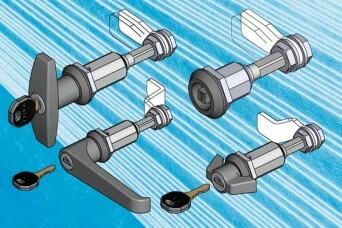 Design of these compression latches provides good protection from vibration plus it enables simple depth adjustment. The added gasket pull-down available, coupled with depth adjustment, produces an improved gasket seal together with a more robust closure regime. EMKA compression latches are typically sealed to IP65 but are available up to IP69. They come in zinc die, aluminium or stainless steel with 26 types of industry standard inserts, plus wing handles, L handles and T handles incorporating profile cylinders. Share the post "Compression Latches – vibration proof and adjustable"